Multiple purpose pressure gauge, competitively priced: pneumatics, hydraulics, plumbing, HVAC, compressors, pumps, pools, etc. Equipment manufacturers, plumbing, HVAC and mechanical contractors. Designed for optimum precision where accuracy and repeatability are of the utmost importance. Used in laboratories and various industries that require precise measurement. Manufactured entirely at our facility in Delson, Qc. Calibration test certificates traceable to NRC and to NIST are available. 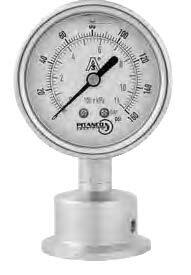 Competitively priced gauge for multiple use: industrial, plumbing, HVAC, hydraulic, pneumatic, compressors, pumps, pools, etc. 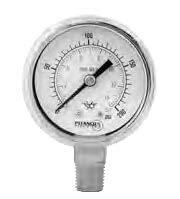 Superior quality multiple purpose pressure gauge: pneumatics, hydraulics, plumbing, HVAC, compressors, pumps, pools etc. For pressure reading on oxygen and acetylene bottles regulator. Primarily used where panel mounting is required: air pressure, oil, water or any process compatible with brass. Competitively priced gauges for multiple use: industrial, pneumatic, hydraulic, plumbing, HVAC, pumps, compressors, etc. *Models LFSSW 4 in (100 mm) and 6 in (150 mm) are dry but liquid-fillable. 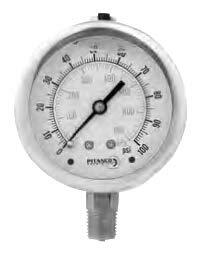 Ideal gauge for low pressure measurement of fluids and gases both corrosive and non-corrosive. Used in refineries, paper mills, water treatment plants, etc. Used to measure precise gas pressure in manifolds installed on boilers, furnaces, dryers and other equipment that operate on low pressure gas or natural gas. Used in refineries, chemical plants, industries, etc. Where operator safety and accuracy are very important factors. Designed for increase accuracy. To be used where accuracy and repeatability are of the utmost importance. Used in laboratories and industries that require precise measurement. Manufactured entirely at our facility in Delson, Qc. Calibration test certificates traceable to NRC and NIST are available. Food processing, dairy, beverage, pharmaceutical and chemical industries. Primarily used where rigorous and meticulous maintenance is required. Conceived to prevent the accumulation of bacteria that may build up on threaded connections and facilitates the cleaning of the instrument. 1 ½ in (40 mm) or 2 in (50 mm) "sanitary Tri-clamp®"